As temperatures cool down my kids immediately start thinking of hot chocolate when they come inside with chattering teeth and tingly fingers. While we love to indulge and have some hot cocoa from time to time, I clearly don’t want to be loading everybody up with sugar every day. Instead we get a bit creative with hot chocolate inspired play. In the past we’ve had a ton of fun with this surprise hot chocolate science experiment and quite a bit of hot chocolate sensory play ideas. As part of our ongoing partnership with Elmer’s we decided to test out a hot chocolate slime recipe for this winter. It’s definitely not for eating, but it’s way more fun than a sugar crash! GET A FULL WEEK OF WINTER THEME ACTIVITIES IN OUR PRESCHOOL WINTER LESSON PLANS. Note: As with any play recipe we recommend that adults supervise children closely. No part of this should be eaten or put into children’s mouths. If kids have skin sensitivities, test with care. 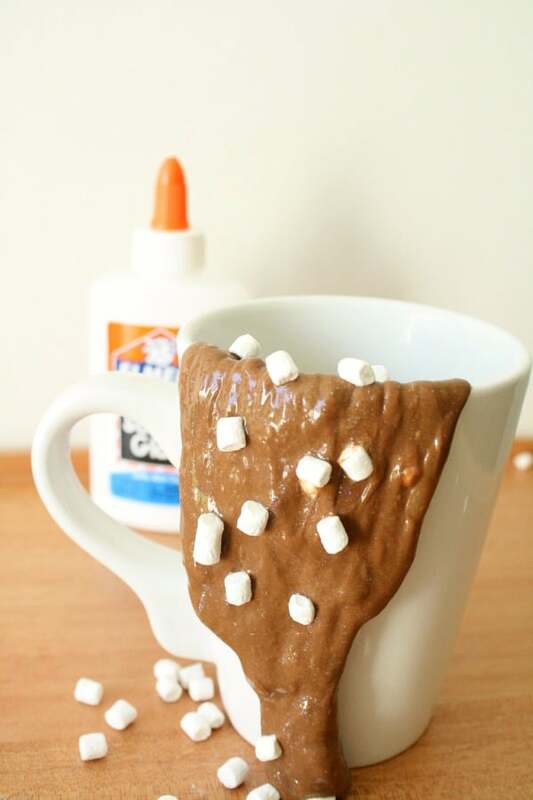 Watch this quick video to see the steps for making hot cocoa slime in action. 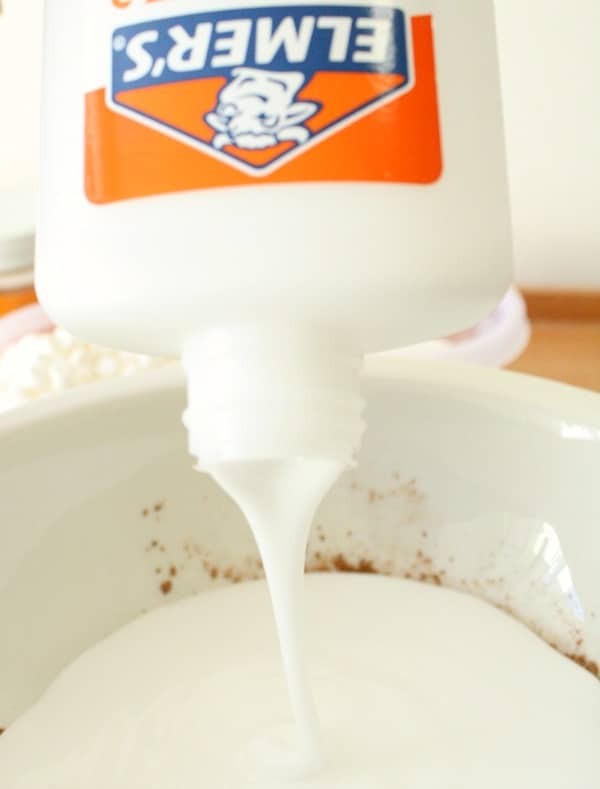 Elmer’s is our go-to adhesive solution to use for making slime because of the excellent variety of glues they offer. 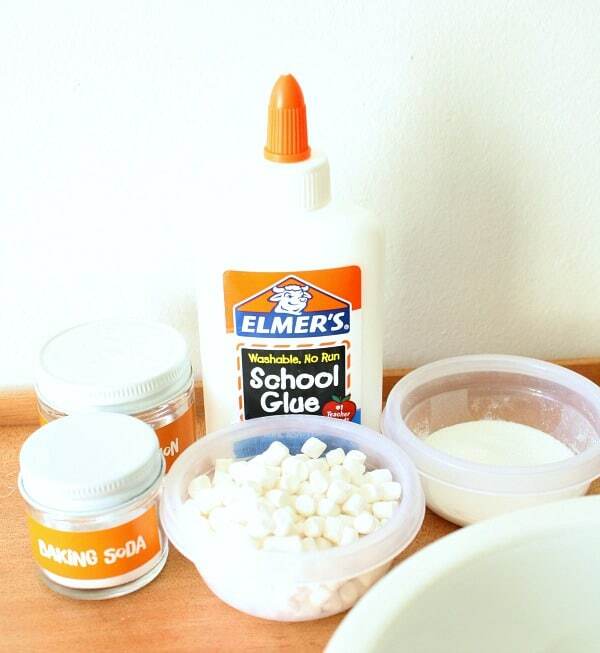 For this slime recipe we turned to our tried and true favorite white School Glue from Elmer’s. The creamy white solution makes the perfect base for this slime. To make your own hot chocolate slime, start by mixing up your favorite slime recipe. If you don’t have one yet, pop over to Elmer’s amazing slime guide and check out all the recipe options there. 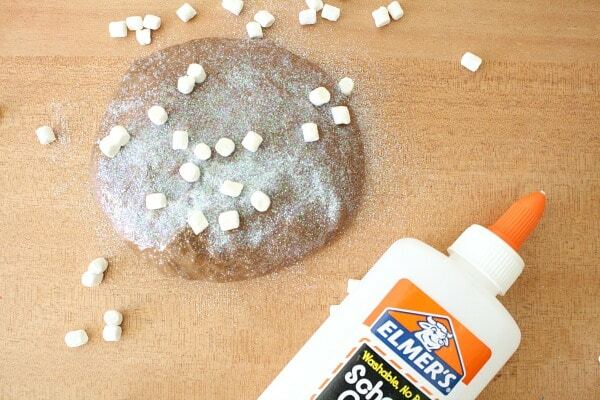 We used the basic recipe with 4 ounces of Elmer’s White School Glue, 1/2 Tbsp. of baking soda, and 1 Tbsp. of contact solution. To get your desired shade of “hot chocolate” add in brown food coloring OR 1 Tsp. unsweetened cocoa powder (remember that this slime is NOT EDIBLE). Of course you can’t have hot chocolate without marshmallows (at least not in my house!). Decide what you would like to use to represent marshmallows in your slime, but be sure little ones do not eat your “marshmallows.” Some options are sparkly white glitter, white confetti, dried marshmallow bits, small white beads, or white foam pieces cut into squares. After we mixed up our hot chocolate slime my daughter couldn’t wait to get her hands on it! Next she spent some time squishing the slime and watching how the glitter moved through it. She squished and reshaped the slime over and over again. Then it was time to experiment and see how stretchy it was. She liked placing all of the slime into a mug and then slowly stretching it to see how long it would stretch before it would separate or come completely out of the mug. It was so stretchy her little arms weren’t long enough, and she had a to get a stool to continue her investigation! When big sister and her friend came home the immediately entered the room with “oohs” and “aahs”. Then they spent the afternoon playing with this simple slime recipe too! Most of the time we simply make slime to have a bit of fun, but this slime can also be used for special occasions. Give it out as holiday party favors or gifts. 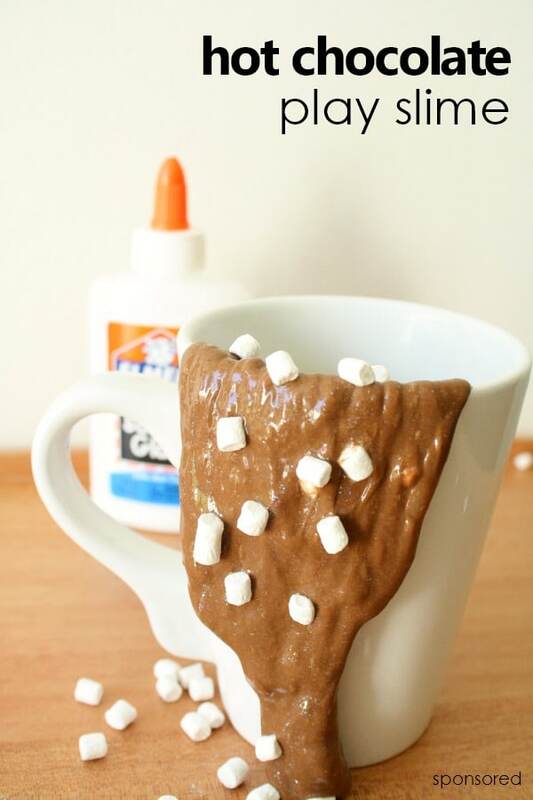 Mix up some of the plain hot chocolate slime. Add it to individual containers. Inexpensive mugs or plastic containers will work well! Add in a small package of your choice for “marshmallows”. Then wrap the whole set in clear cellophane. Add a bow, and ta-da! Easy winter gift! Make it for a Winter Celebration. 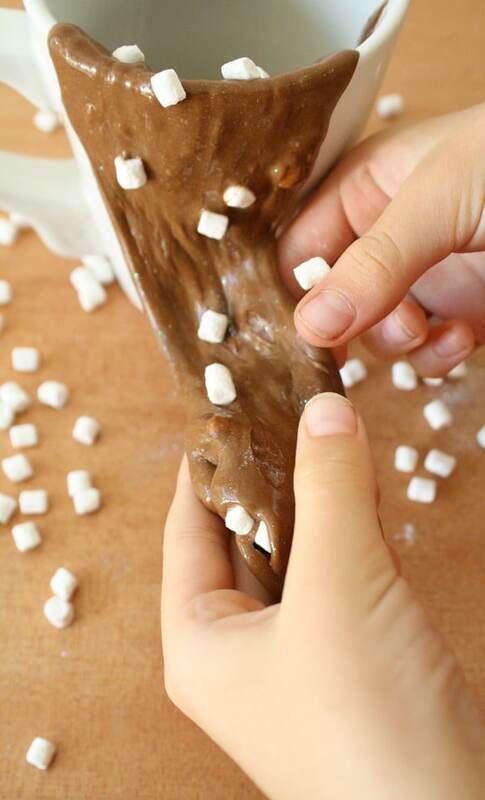 Whether you’re planning a winter playdate or a class holiday party, this hot chocolate slime would be a fun sensory experience. 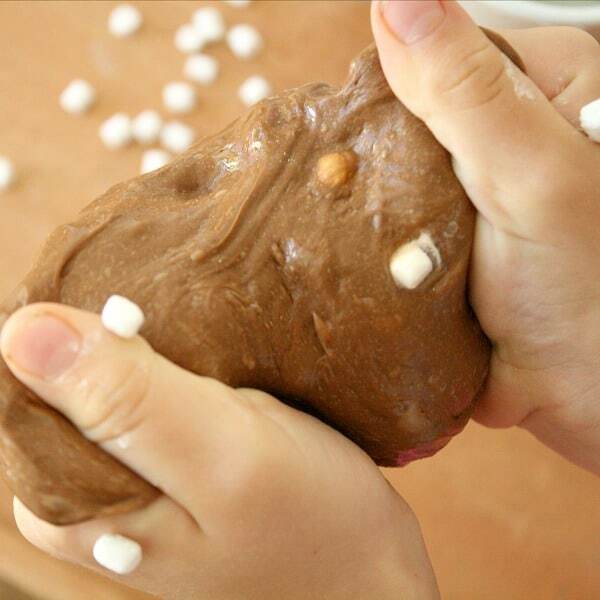 Mix up a batch of this hot cocoa slime, and kids will have something fun to play with during the event. WANT TO TRY SOME MORE DIY FUN WITH ELMER’S? Make your own confetti slime for birthday parties or New Year’s Eve. Use your favorite slime recipe to try these fun things to do with slime. Make your own air dry clay. Then use it to make sculptures. 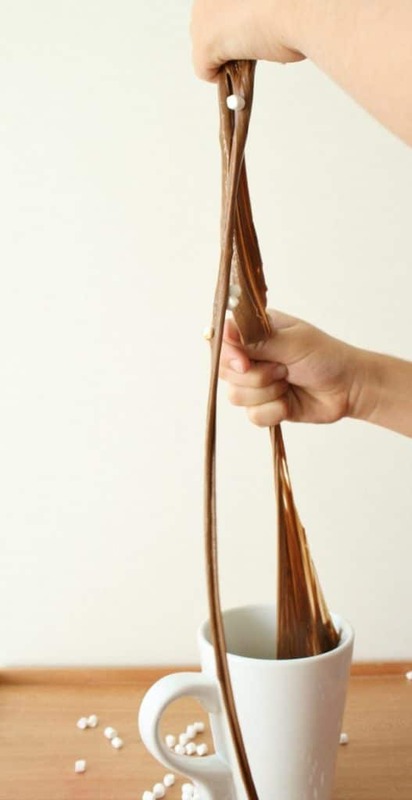 Try making this DIY silly putty. Or create your own sparkly suncatchers. For more fun kids’ craft inspiration, visit Elmer’s and sign up for their newsletter. Make sure to also check them out on Facebook, Twitter, Instagram and Pinterest. Note: As with any play recipe supervise children closely. No part of this should be eaten. If kids have skin sensitivities test with care. Save time and get right to the playful learning with our printable lesson plan sets. 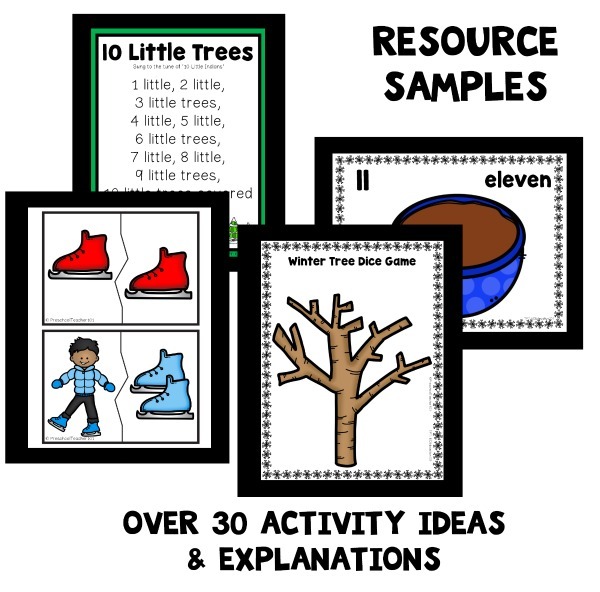 We have a variety of lesson plan sets that work well as winter themes. Each set includes over 30 playful learning activities related to the theme, and we’ve provided different versions for home preschool families and classroom teachers so all activities are geared directly toward your needs.